It is a shame that most books that talk about state machines take a very abstruse approach to the topic. FPGA designers use state machines to reason about digital design, but I don't think many programmers think of using formal (and maybe generic) state machines as often as they should. It is a shame that most books that talk about state machines take a very abstruse approach to the topic. FPGA designers use state machines to reason about digital design, but I don't think many programmers think of using formal (and maybe generic) state machines as often as they should. Of course, we often write what amounts to a state machine without thinking about it. For example, consider a traffic light. The lights are outputs, and red, yellow, and green are the states. Some even have buttons for pedestrians to cross (I don't know why Brits call those pelican crossings). How would you write firmware for a traffic light? If you've done hardware state machines before, you might recognize this as the difference between a Mealy machine and a Moore machine. A Mealy machine is a state machine that uses its inputs as part of how it forms its outputs. So the transition between states is what sets the outputs. In a Moore machine, each state has an output associated with it (just like the last two tables). If you use sequential state numbers, you can pack a lot of states into a small variable (256 states in one byte). That's a good thing, but it becomes hard to manipulate them in certain ways. For example, suppose you wanted a state table that had an entry for "the current state is state 0 or 7." Your state table would have to take a list of current states, which is both wasteful (especially in the common case) and drives up code complexity. On the other hand, you could use what hardware designers call "one hot" encoding. 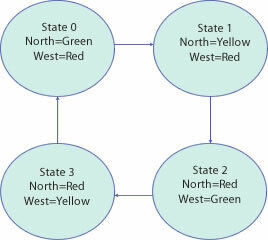 In this scheme only 1 bit of the state variable can be set at one time and it represents the state. So 1 is state 0, 2 is state 1, 4 is state 2 and so on. This makes it very easy to figure out which state is active and also makes it easy to describe things like "current state is 0 or 7." The downside, of course, is that now a byte can represent 8 states instead of 256! So far, the traffic light is pretty simple because the only input is a timer. Next time, I'll show you how it would look with some physical inputs, and present some code and tools for handling generic state machines. Maybe your next programming job can be simply filling in a state chart!